The closure of the Lloyds TSB Bank plc Group Head Office building in Lombard Street, City of London presented the Group with a particularly interesting challenge. 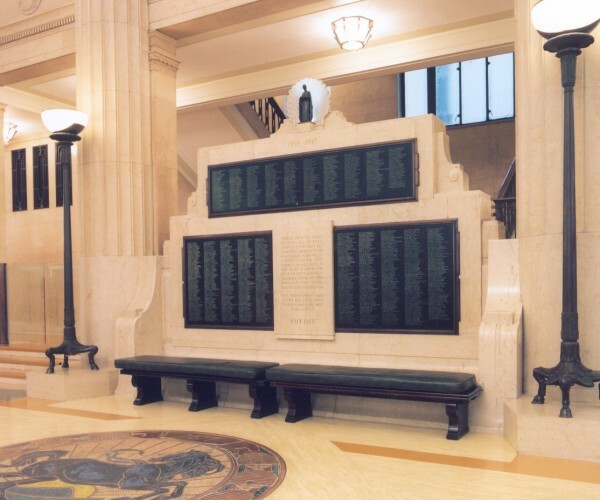 What to do about the Lloyds Bank War Memorial which dominated the old entrance hall with it's long list of names of employees who had lost their lives during the two World Wars. This Memorial had traditionally served as a focal point for the Lloyds TSB Group collective commemoration on the 11th of November each year. A memo to Archie Kane,a Group Executive Director, produced a very positive response and within a couple of weeks, a working party had been formed under the chairmanship of the Group Deputy Chairman, Alan Moore, and other interested parties including the Royal British Legion. The Working Group quickly identified a number of objectives. Firstly, what to do with the Lombard Street Memorial. It was evident from the start that the style of the Memorial did not suit the glass and metal interior of the Group's new headquarters building in Gresham Street. Secondly, how to provide a focal point for remembrance in the City of London. Thirdly, how to protect other War Memorials from around the Group. So, who were the individuals listed on the Memorial? What were they like? Where did they work? By enlisting the help of the Group Archivist, the Public Record Office, The Commonwealth War Graves Commission and the Imperial War Museum it is possible to draw together details for every one. For example, Michael Hugh Hicks-Beach, shown on the Memorial as Viscount Quenington. 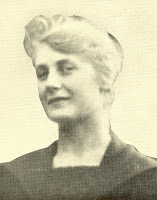 Hicks-Beach was a main board member at Lloyds Bank and was also Member of Parliament for Tewkesbury. 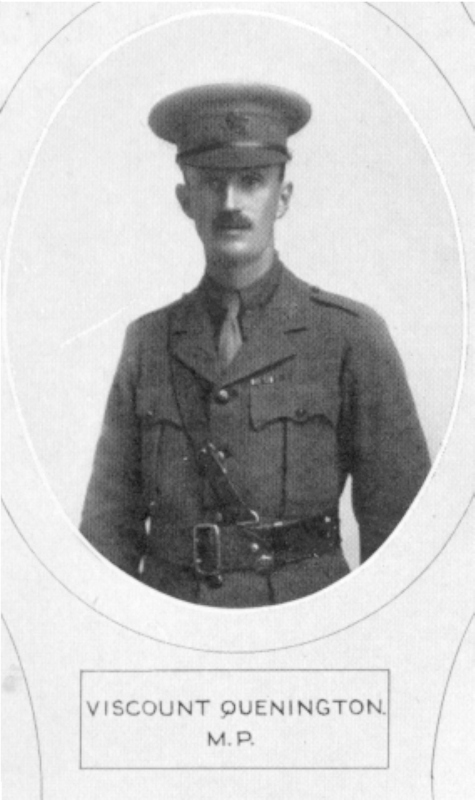 Son of the 1st Earl and Countess of St Aldwyn he served with the 1st Royal Gloucestershire Hussars and died on the 23rd April 1916 as a result of wounds received at Katia, Egypt. He is buried at the Cairo New British Protestant Cemetery alongside his wife, who, coincidentally died of disease on the 5th March of the same year. One particularly poignant aspect of the WWI memorial is that 28 of the listed names were killed whilst serving with the 26th Royal Fusiliers (Bankers Battalion). Hundreds of young men from Lloyds Bank volunteered for service and joined this 1,500 strong unit which consisted entirely of bank employees. Twelve of the Lloyds contingent were killed on the first day that the 26th Bn went into action on the Somme at Flers in September 1916 (the first time tanks were used in battle). Two of these lads were from the Portsmouth Area. 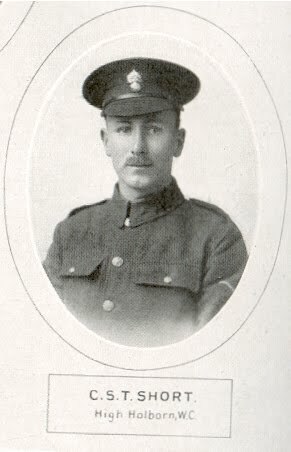 Nelson Upfield of Gosport worked at Avenue, Southampton Branch and joined the 26th Battalion, having travelled up to join the queue at the enlisting station set up in St Pauls churchyard within a few months of the outbreak of hostilities. His friend Cyril Short from Southsea was in the queue on the same day. Cyril worked at High Holborn Branch. Both were killed on the Somme during that first battle. 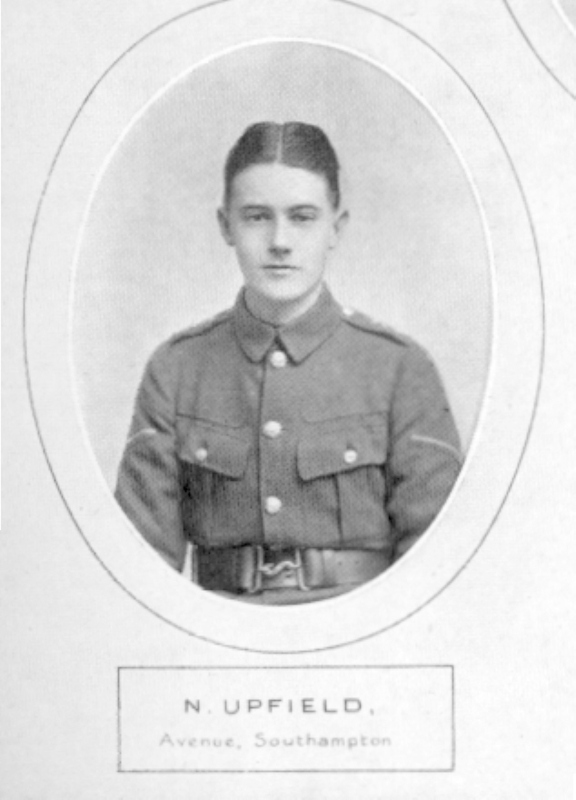 Upfield was just 19 years old and both are commemorated on the Thiepval Memorial since their bodies were never recovered. The names listed on the WWII section of the Memorial have other stories to tell. The only woman featured is Marguerite Frances Pillow who worked at Branches Stock Office in London. Marguerite was killed along with her 9-year-old son when a V2 rocket fired from Holland hit her house at 73 Crystal Palace Road, London very early in the morning on the 15th March 1945. So what has the Working Group achieved? Firstly, the Lombard Street Memorial. A number of potential sites were identified and most were discounted. Consideration was given to the relocation of the Memorial at the National War Memorial Arboretum in Staffordshire. Finally, it was agreed that the best site for the Memorial is in a major Group building and Canons House, Bristol seemed to fit the bill. Those of you who work in Bristol or have visited Canons House recently will know that the Memorial has now been installed. Secondly, what to do by way of commemoration at Gresham Street. The Royal British Legion had a major role to play here and after lengthy deliberation a new Memorial was put in place right outside the main entrance to our Gresham Street office. 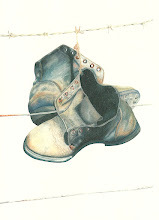 Additionally, a commemorative book was commissioned. This book, which can be viewed under glass in the reception area at Gresham Street, contains names from the Lombard Street Memorial and other known Memorials from around the Group. Space has been left to include further names in the event of other Group Memorials being discovered and/or the death in service of other Group employees serving in current or future conflicts. Thirdly, the other War Memorials? 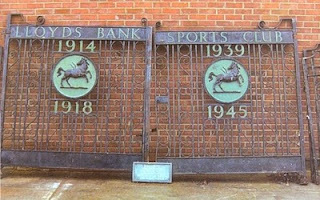 Amongst the 54,000 memorials registered on the Imperial War Museum Inventory, nine have a direct association with Lloyds Bank. Two are (as far as I know) in situ in East Anglia. Risby Gate, Bury St Edmunds Branch and the old Trustee Savings Bank building in Norwich. Others from South American subsidiaries such as the Anglo-South American Bank and the London & Brazilian Bank are now safely in storage in the care of the Group Archivist. A plaque acknowledging the efforts of Head Office staff who raised sufficient money to buy a spitfire during WWII is amongst these items. 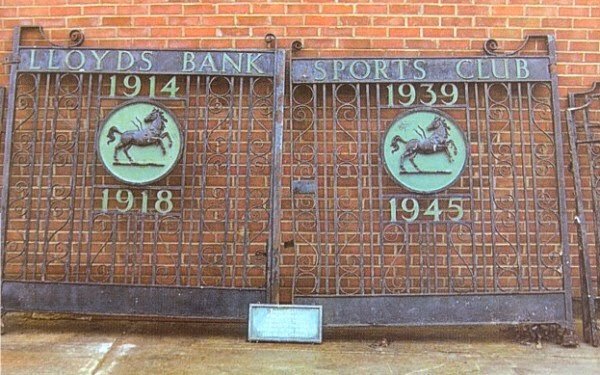 Of particular note are an old Capital & Counties Bank Roll of Honour, beautifully inscribed and mounted in a gilded frame and the Memorial gates from the old Lloyds Bank sports ground at Beckenham. The memorial gates have been installed in the grounds of the Lloyds Banking Group University, Solihull. The Lombard Street Memorial (now in Canons House, Bristol) and the new London Memorial (at Gresham Street) were re-dedicated as part of the Group remembrance activities on the 11th November, 2004. The Group Archivist presented a display of relevant material at Canons House, to coincide with the rededication ceremony. Hundreds of staff members attended and many were moved to tears as the bugler played the Last Post - the notes floating throughout the building. One final plea - there may be other Memorials out there. TSB, Scottish Widows, Lloyds Bank and other constituent businesses (some since subsumed into Lloyds TSB proper). If any reader knows of any please provide details. 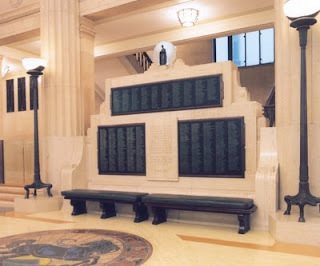 It is important that Corporate bodies such as Lloyds, protect Memorials so that future generations can bare witness to the sacrifices made by their forbears. Note: since writing this article the Group has acquired a number of new brands. No doubt there are many memorials for employees of recently acquired institutions like the Bank of Scotland and Halifax waiting to be discovered and recorded.